c.. Use SPF 24 or higher sunblock on face, neck, ears, and shoulders especially. This greatly extends the burn time. d.. Don’t wander around in the sun exposing new unprotected “pink” skin for a couple of hours. You’ve just come from the Northern Hemisphere Winter into a fierce Southern Hemisphere Summer. Common sense goes a long way. e.. Wear cool colours (like white Tees etc) rather than black – the black clothing will get hot and you’ll be tempted to take it off. Do I need a visa, or is a UK passport still good enough for NZ? Refresh my memory on what the temperature range we should expect. Do we need full leathers or can we get away without chaps/leather pants? How about gloves? Do we need winter or just summer gloves? What sort of weather can we expect in October ? Can couples ride together on one bike? Yes, we do have couples hire and ride together on the same bike. You may find our one of our specialist tourers (e.g. BMWR1200RT, Honda ST1300 Pan European, GoldWing 1800) best for comfort. It does ultimately come down to your physical size however – if you let me know rider and passenger height and approx. weight I can comment with more accuracy. September is very changeable, starting to warm, the odd fall of snow around at high altitudes. Temps from 35F-60F. October is similar, but a little warmer – can be wet and windy. November is getting nice – drier, 50F-80F. A good month to tour. You can still get the odd cold snap though. Not many tourist around, roads are clear. November is the earliest we pre-schedule tours, but we would do custom tours earlier. December – ditto, warmer, 55F-85F. Late Dec is often wet, heavy rains sometimes. January – a great month, as is Feb and March. (IMHO the best single month)- usually very warm and dry. Tourism is at a peak – lots of people, the place is very “alive” if that’s what you’re looking for. North Island or South Island? If you only have 14 days, don’t try to see both Islands – just do the South. And don’t try to see it all. EVERYBODY leaves here saying “I didn’t leave enough time” or ” I had to rush everyday – I’ll have to come back”. For this reason we now do a 14 day “relaxed” tour – we stay in only maybe 7 selected places, two nights in most, giving you time to see and do things. You won’t see it all, but you will have seven or so different “mini” holidays and you’ll go home feeling refreshed and invigorated (and wanting to come back for more..) rather than going home tired and frustrated because you were on the move every day. My wife is a rider of several years but weighs 105lbs. She is also uncomfortable on a sport bike. She has her own Yamaha 400cc street bike. It has a “bench saddle” and is more of a straight ride with the pegs right under her. I’m sure you have a similar ride for her. Which bike do you recommend for her? Re your wife and the size of bike. We have just had a tour group of Americans through, and one of the ladies rode herself. She was 5’3″ and 110lbs, and we lowered one of our low seat, low frame BMW F650GS 800cc twins for her – this gave a seat height of 26″ and she found it very comfortable and quite manageable. The ride position is “sit up and beg”, for want of a better term. We will always have bikes in our fleet to ensure we have catered for everyone. Additionally, larger bikes like BMW’s R1200GS can be fitted with a low seat, so that even those with Duck’s Disease, like me (5’6″) can easily get both feet firmly planted on the ground. We enjoy riding in the summer weather. Is February reasonably dry and warm? We would only be interested in a tour with a “chase van”. Riding with all our gear and living out of saddle bags doesn’t really appeal. How can we know that there will definitely be a chase van. We only ever run guided tours with our luxury chase coach now. Initially we anticipated that we may want to reserve the right to leave the coach behind if numbers on one particular tour was low , but we quickly learnt that the coach and backup trailer are essential. 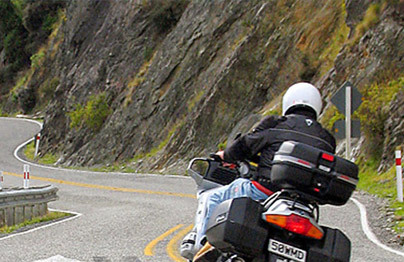 You just cannot do a professional guiding job from a motorcycle – the coach has many uses, from carrying luggage, backup spares, tools, spare fuel, to using the coach to ferry people on the tour to dinner maybe, or to see some local attraction. Motorcycle passengers are also welcome to ride in the van if the feel the need.. The coach will accompany every tour in the future. Should we fly into Wellington , and then do you arrange to pick us up, or how does that work? If your first point of entry is Auckland, let us know and we’ll organise return transfers to/from Auckland for you – generally we can get you flights at a good discount (often better than you’ll be able to get). These flights are at your expense – we charge back later :-). This is the case for whatever airport you fly into actually… Nelson is the service centre for most of the NZ domestic aircraft fleet, so there are plenty of direct flights in an out of here (every 1-2 hours). We are interested in a Self Guided Tour 14 days. Dierk himself, as marked in the form, rides a Triumph and has 20 years of riding experience. But my license is brand new, and so I am restricted to 34PS in germany. that’s what I did to my Tiger.. so please tell me, if this is the same in NZ. In NZ we have “restricted” and “unrestricted” licences. 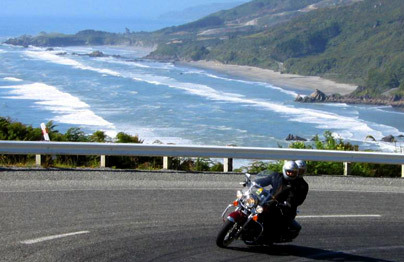 Restricted means as a New Zealander you can ride no more than a 250cc motorcycle (no power limits yet..) if you are over 25, and successfully complete all the skill based tests, you can obtain an unrestricted licence in 9 months. If you are under 25, it takes from 12-18 months. But here’s the interesting thing: If your licence in your country states that you can ride a 650cc motorcycle in your country, then you can ride a 650cc here, using your licence. 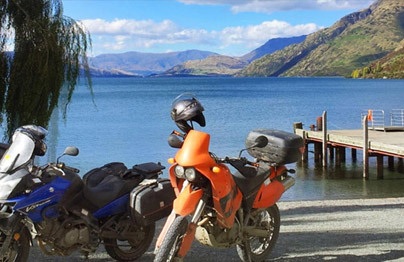 The NZ laws state that you are able to ride the same capacity motorcycle in NZ, that you are licenced for in your own country ( they don’t mention power ratings). If you have a current full licence in another country, it is valid here. You don’t need to bring an International Driver’s Licence. Your rate is a bit higher (up to $700 USD for 14 days and 2 people) than the other operations I’ve looked at, but you seem to be much more accommodating and responsive. Can you tell me a bit more about how your service is expected to differ from what I would get from companies like NZ Motorcycle Rentals, Beach’s Motorcycle, and Edelweiss? B. Because we can fit our smaller groups in there. We aren’t the cheapest operator in New Zealand, but we do genuinely strive to be the best. I appreciate your lengthy and personal response before and the testimonial (she sounds like me). I look forward to hearing from you. Thanks. Jenn was a real fun girl – if you’re anything like her, we’re going to have a ball…. ( I enclosed a pic of her playing up on her husband Jack’s birthday). Have a digest of that lot. I honestly believe the US$700, while a significant amount, is more than compensated for by our higher degree of personalisation, luxury and the energy and enthusiasm we put into making sure you go home absolutely knocked out. At the end of the day, I believe you will feel you had excellent value for money. What does the average participant spend on fuel and oil? Typically you will cover about 4500 – 5000 kilometres, or 2800 to 3215 miles. The bikes do an average of about 40 miles to the gallon (imperial), so you’ll use about 75 gallons of fuel, or 337 litres. Premium fuel costs about NZ$2.00 cents per litre, or NZ$9.00 per Imperial Gallon or NZ$7.00 per US Gallon. So you’ll spend about NZ$675/US$506/ UKP337 on fuel. You don’t pay for oil, and neither do the bikes tend to use any. I can’t remember when I last had to add oil to one of our tour bikes..
Do you make available trip insurance or would I have to make arrangements elsewhere? We recommend that you should arrange your own travel insurance – travel insurance policies in New Zealand seem to be restrictive, and expensive. We can provide insurance excess/CDW cover. Please enquire for the current rate. In making flight arrangements where exactly do I have to fly into and exactly what dates and times do I need to know? Just get yourself to Auckland and let me know your flight details. I will co-ordinate and book the transfers into and out of Nelson for you. I can get them at a better rate than you can, plus I like to co-ordinate the arrival of our clients into Nelson – I can then do a better of job of picking you up and getting you to your pre-tour accommodation. We will settle up the cost of the internal flights upon your arrival. Do I need a special drivers license to ride a bike fitted with sidechair. This is not the case in Denmark wherefore I do not hold such permission. Further more, do we need an “International Drivers License? No, in NZ all you need is an unrestricted motorcycle licence. Your Danish one is sufficient, you don’t need an International Driver’s Licence. From my perspective, I only need to be re-assured that you have had reasonable experience piloting a chair…. Now some practical details. My wife is 165 cm tall and probably needs an “adjusted” bike as you describe in your FAQ. If possible we would prefer that our son, who will ride as rear seat passanger, can ride on both bikes, which basicly means adjusted foot rest height on both bikes. You mention “minor adjustments” in your FAQ, but I’m not quite sure how much work the above adjustments require, but hope it doesn’t require too much additional work. I’ll have a look at it again and see how much work is involved – it varies from model to model. If it’s not a big job there will be no additional charge, but if a bit of jiggery pokery is involved, there would be a nominal charge. How tall is the little critter who will need the footpeg mods? As for adjusting the height of the bike for you wife, this is no problem at all – no charges there. Can you explain how the rest days work please..? They occur where we spend 2 nights at a particular spot. The second day becomes a Rest Day – there’s no riding on that day unless you feel like it. It gives you time to catch you breath, mellow out, look around. On a 14 day tour there are three 2 night stopovers. This is a very popular format that our past clients have particularly enjoyed. We occasionally run a 10 day tour that travels the same distance as the 14 day tour. This can only be accomplished if we take out the 2 day stops – it’s quite a hectic pace. We believe that, for the people who only have 10 days, the best option is to join the 14 day tour and depart early as I’ve suggested above. In this way you still get the “relaxed” pace of the 14 day tour. Yep. As much as you like. Bring the kitchen sink. What is the availability of hiring biking clothes, or is it best to bring our own, I’m thinking more of helmets. What is the difference between the types of accommodation, i.e. are they en-suite. The difference between our tour packages is largely a matter of the quality of accommodation, the size of the group, and the time of year. Don’t forget we can provide you with a “Super-Deluxe/Customised” package upon request. The “base” prices is based on “share twin” accommodation. You’re welcome to have a room to yourself for an additional charge (Single Occupancy). The rate for S.O. varies with the length of the tour. Mimimum of four (4) people per tour. Best Value Tours will be cancelled three (3) months prior if minimum number are not achieved. You may choose to cancel with no penalty or upgrade to the Deluxe package. Tour group numbers are often larger than on a Best of The Best. On a typical Best Value the level of accommodation varies with type of lodge, inn or motel we are using. Wherever possible we try to stay out of boring motels and we concentrate on more interesting but good quality B&Bs. It may be that occasionally you will have to make allowances for the age of the accommodations. In 1863, large spacious rooms with ensuite bathrooms weren’t commonplace, you may find yourself in a room with a double bed (rather than a king or queen size) and sharing a bathroom. Obviously on this type of tour we occasionally have placed the richness of the experience of staying in a gold rush era hotel ahead of absolute luxury. That is not to say you’ll find yourself compromising every night – we have taken great care to maximize your level of comfort, while still providing a rich and rewarding “off-the-beaten” track experience. Prices quoted are for Single Occupancy (i.e. – you get your own room ). Smaller, very friendly and personal tour parties. No minimum tour group size. Our Best of The Bests are never cancelled due to minimum numbers. A Best of The Best involves the use of a higher level of luxury accommodation than we use on our “”Best Value”” tours – we use small luxury “boutique” style lodges and B&Bs, the occasional well appointed hotel or motel. Ensuite bathrooms are generally the norm, with queen or king size beds. Other treats and benefits might include, special cooked breakfasts (venison sausages and the like), a complimentary glass of wine or port etc, a robe to wear in your room etc, and smaller tour groups. What other costs are involved i.e. insurance. Comprehensive insurance is included in the tour price. You have your fuel to take care of (about NZ$650 worth in general), lunches, drinks etc, and pre- and post- tour accommodation. Full face helmet is recommended. Protective/windproof motorcycle jacket & trousers – a 2 piece Goretex/Cordura Aerostitch or BMW type riding suit is best. Small day pack (or bum bag) & water bottle (though you can buy bottled spring water everywhere…). Camera Wildlife shots like whale watching require at least 200mm zoom lens. Good film and processing is available in NZ (avoid taking high speed films through arport X-ray machines). Medium and light weight for under riding gear, something warm with long sleeves. Leisure/Casual (not Business/Casual or Formal or) dinner clothes. NZ is a jeans ‘n T shirt sort of place. Personal items toiletries, sun block cream (SPF24 or higher), sunglasses (a must!). Casual shorts for hot days, maybe some flip flops to keep your feet cool. A baseball type cap can be useful to combat glare and keep the sun off your head. A small flash light maybe. Is there anything I should do to prepare for my trip to New Zealand. One thing worth practicing is your U turns to the right – you’ll be used to doing them to the left. The problem with right hand U turns is that if you need to dab your foot down on the RHS to maintain your balance, you lose access to the footbrake. If your right foot is perhaps skimming the ground in preparation to “catch” the imbalance the tendency is then to grab for the front brake lever if you find yourself going a little too fast. If you’re not practiced at it, the resulting sudden fork dive can catch you unaware and tip you over to the right. It happens all the time to our American and European clients, but the Brits who drive on the same side as us have no problems with it.Also practice stopping on the loose gravel that you’ll sometimes find on our roadside verges and in driveways. Our verges tend to be cambered off for drainage and the sloping gravel surface can catch people out. Should I spend my time equally in North and South Island? I only have 12 days. I’m a little paranoid about sending my credit card details over the ‘net. How should I pay you? 2. Fax us your cc details. 3. Pick up the telephone and tell us your cc number. 4. You’re not getting my credit card info – I’ll get my bank to wire you the amount in NZ funds.